All three spell book options have the same internal components, both in terms of approximately 100 pages of original color content and the hand-made 100% cotton paper. They are all bound by hand, and the content, while originally hand-written, will be printed on the pages except for in the top two tiers. The pages are heavily inspired by the works of H.P. Lovecraft (see the video and some example pages below). Deer Hide Hickory Wood Option: Thickest and heaviest, it is covered in deer hide over 1/4″ thick hickory wood panels, with a raised Elder Sign, metal protective corners, and extra thick spine. Gold Stamped Option: Imitation leather but good thickness and gold stamped Elder Sign on the cover (see video). It has a flat spine. 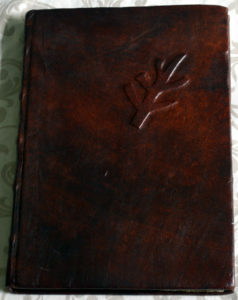 NOTE: There are two rewards with this cover, a blank journal / sketchbook with regular paper, and the printed spell book. 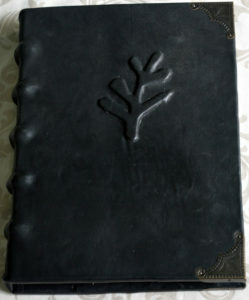 Goat Hide Option: Thin and light (see video), but with a nicely dyed goat hide cover and a raised Elder Sign. We’ve worked to make this the least expensive option and hopefully accessible to most fans. NOTE: The Elder Sign in off center in this prototype but will be centered in the final version.